The turmoil we experienced as a society as a result of this week’s horrific events, reminded me of a scene from one of my favorite cartoons, where the kind captain chases and fights the terrible pirate to rescue the the imprisoned blue puppy that was abandoned by everyone. 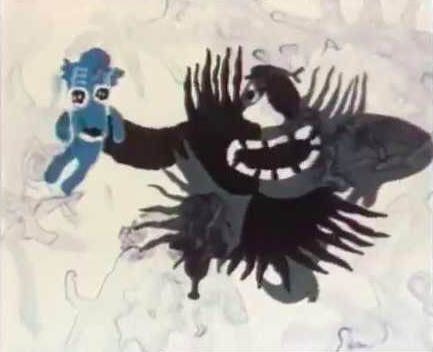 The colorful captain and the black pirate clash in a fight that slowly erases their individual outlines into a blur of colors that mix and blend in the struggle unfolding on the screen. In this quintessential fight between the good and evil we’ve come face-to-face with an ultimate test as human beings. Last week’s events sharply divided us into those that felt compassion and those that were controlled by fear of scarcity, those that embraced the pain of the other as their own, and those who simply tucked their humanity away. This ultimate test came in a form of a cry: a cry for help from the most helpless and unprotected among us, our children. Those of us that FELT the call were shattered by it. We felt as though our own child was taken away from us and left alone crying in a cage, unattended, un-hugged, broken. We felt her pain as ours, we cried with her and we demanded an immediate halt to the cruelty. The ability to understand and share the feelings of another is the definition of empathy, a quality that at the dawn of civilizations served as the defining switch that made us stand apart from apes and ultimately turned us into human beings. What makes us humans today if we don’t feel anymore for the other? No matter what party we belong to, what flag we run, which language we speak, if a cry of a baby screaming for help leaves us unmoved, how can we still call ourselves human beings? The test to FEEL humanness was felt loudly in those that awoke to what was left of humane inside. But let’s not go too far in using this feeling to set ourselves apart from those that didn’t feel. We have all ‘sinned’. Remember when you ignored your own crying baby, yelled at your loved one, failed to help someone in need, or chose to ignore the less-fortunate brother and sister begging for help? The catastrophic event of this week was NOT an outlier or something that just happened out of vacuum. It was a result of an accumulation of smaller misdemeanors we have all been committing as a society, as human beings, by ignoring the real reason we are here. All of us, democrats, republicans, blacks and whites, Christians and Muslims alike have erred by ignoring the small injustices, in carrying on with our small lives, and numbing the barely audible call we hear inside with work, food, alcohol, drugs. The horror we felt this week was not a mere projection of the sum of the pain felt by the 2000 crying children; it was the pain that had been growing and gnawing all around us, accumulating on the balance that finally didn’t withstand its weight, falling sharply and cutting through our hearts with the screeching noise it made with its fall. Those of us that felt it, have a mission now: to embrace this feeling of compassion, as painful as it might be, and hold on to it as tightly as possible. We who felt, need to struggle for the small and the big, for those near and far away that are in need, to give up something material in lieu of compassion and love. As for those others, who tucked away behind the walls of the frozen castles they’ve erected around them, let them be. Their castles will melt with the heat of our love, break under the squeeze of our powerful union, shatter with the vibration of our chant for humanity. I believe that we are in for many more of those terrible tests. When they come next, let’s not look away or turn our backs ever again. Let’s allow ourselves to FEEL, to pain, to cry, and let’s allow this feeling to be our compass when nothing seems to make sense anymore. As the fight between the good and evil continued, the colorful splashes emitted by the captain slowly absorbed the black spots spat out by the evil pirate. The blue puppy was saved and the evil forces lost their power in a simple sneeze that made the pirate disappear. The love and compassion overpowered the dark evil forces. You are not alone in your fight. When you choose humanity and love, the balance is on your side. The pain and darkness that has invaded our world can vanish one hug at time. Who will you embrace?